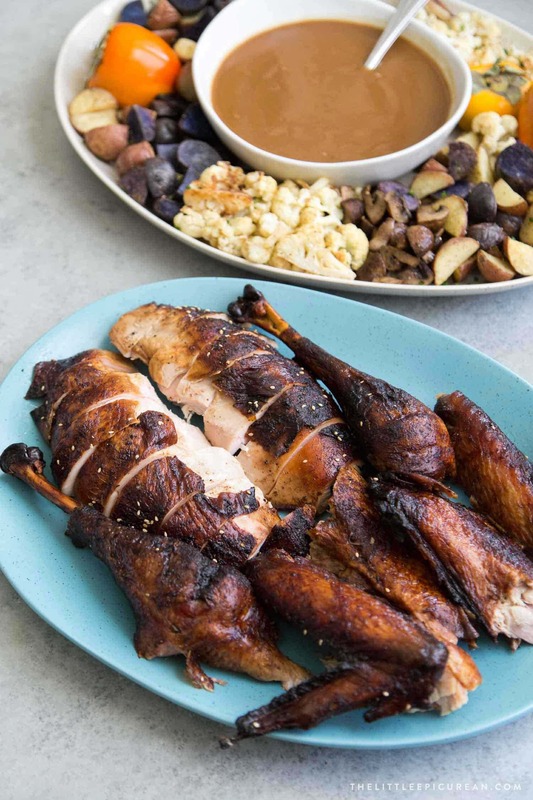 This Sesame Soy Sauce Roasted Turkey adds an Asian twist to Thanksgiving turkey. Best of all, this recipe requires no brining! Turkey. It’s the centerpiece of every Thanksgiving feast. But what if you’re not a fan of turkey and the traditional fixings? When I saw this roasted turkey by Joanne Chang in Food & Wine last year I knew I had to give it a try. 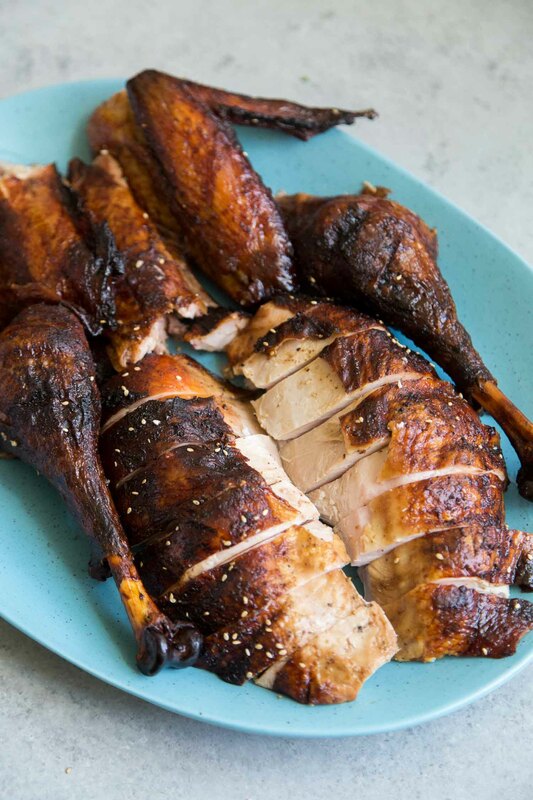 Here’s an Asian twist on the classic roasted turkey. The turkey is marinated and basted with a sesame soy sauce mixture infused with ginger and garlic. The resulting turkey is moist and flavorful. Instead of mashed potatoes, you might want to serve this soy sauce roasted turkey with steamed white rice! My husband has been using Alton Brown’s Good Eats turkey brine recipe for well over a decade (15 years and counting!). He is in charge of the official turkey our family will be eating. Why brine? The salt solution seasons the turkey meat and adds much needed moisture. However, brining takes time and additional preparation. Over the years, brining has lost its popularity. More and more chefs and home cooks are skipping this step. 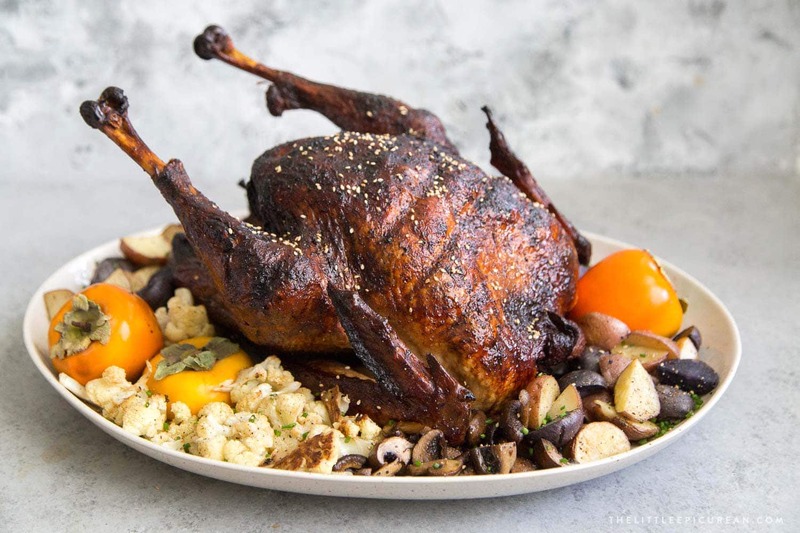 This sesame soy sauce roasted turkey does not use a brine. Instead, it is marinated for an hour. That’s it! The marinade is made from mixture of soy sauce, sesame oil, brown sugar, ginger, and garlic. Soy sauce is made from fermented soybeans. It is widely used in Asian cooking, where it is used as a marinade and a condiment. 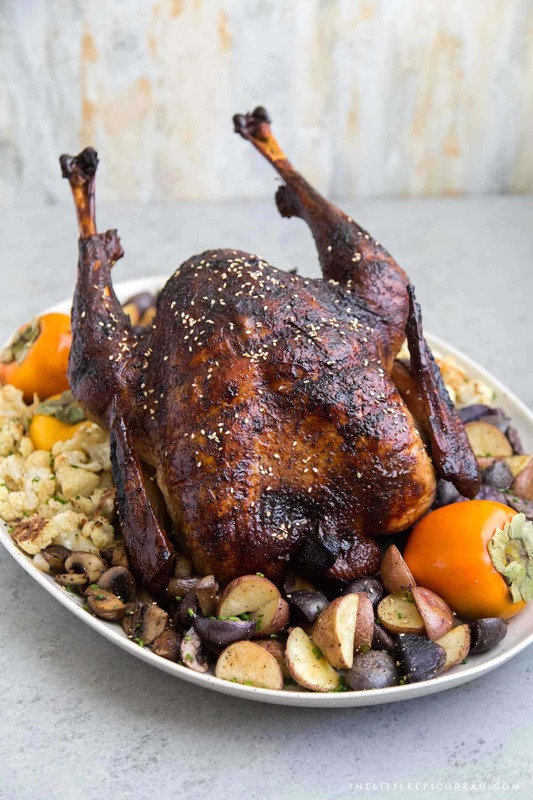 It works wonderfully with turkey, adding a well-rounded salty yet slightly sweet umami flavor. The addition of sesame oil adds a rich, warm nuttiness that keeps you coming back for more. Just like the traditional turkey and gravy, this gravy is made using the turkey pan drippings. Asides from the pan drippings, you will be need low sodium chicken broth (or homemade chicken stock), flour, and unsalted butter. 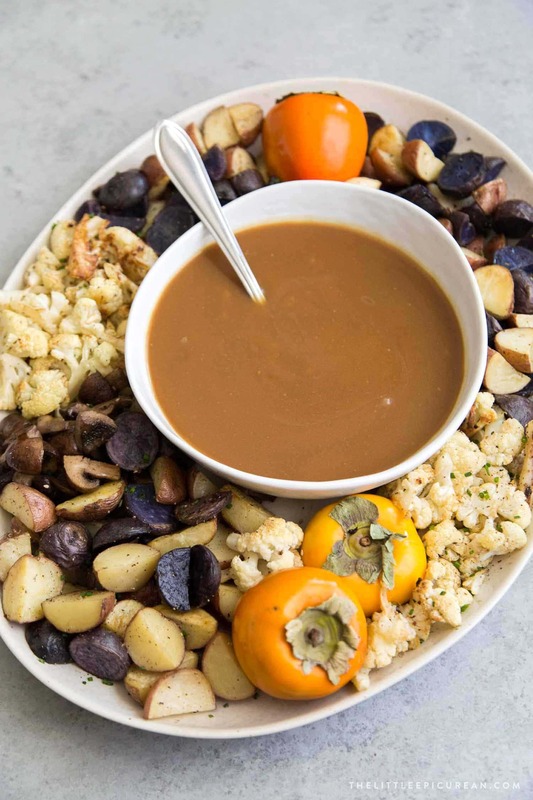 The soy sauce gravy is delicious served over roasted vegetables. I like it drizzled over a baked potato! Carve ahead of time or carve at the table? TV and movies makes carving the turkey at the dinner table SO EASY. With everyone staring with hangry eyes, carving the turkey table side can be nerve wrecking and messy. It is MUCH easy to carve the turkey on a cutting board instead of a beautiful serving platter table side. Real Simple has my favorite turkey carving tutorial video. Best of all, because the video is only a minute long, it gets straight to the point! That being said, I’m a fan of carving the turkey ahead of the time in the kitchen! Remove turkey neck and giblets. If desired saved turkey neck to make stock. Pat turkey dry with paper towels. Whisk together soy sauce, brown sugar, sesame oil, ginger, and garlic in a very large bowl. Place turkey breast side down into bowl. Marinate at room temperature for 30 minutes. Turn turkey and marinate breast side up for 15 minutes. Turn turkey breast side down and marinate for another 15 minutes. Preheat oven to 350 degrees F. Remove turkey from marinade. Reserve marinade. Place turkey, breast side up*, on a rack in a roasting pan. Season turkey inside and out with salt and pepper. Stuff the turkey cavity with scallions, garlic, and onion. Loosely cover turkey with foil tent. Place in oven. Pour 2 cups water into roasting pan. Roast turkey for 4 1/2 hours, basting the turkey with reserved marinade every hour. After each basting, add 1/2 cup of water to roasting pan. Remove foil tent. Roast uncovered for 30 minutes, basting once more after 15 minutes. Turkey is cooked once the an instant-read thermometer inserted in the meaty part of the thigh registers 165 degrees F. If turkey is not done, add foil tent and continue to bake until fully cooked. Transfer turkey to a cutting board or large serving plate. Let stand for at least 45 minutes before slicing. Before serving, garnish turkey with toasted sesame seeds. Meanwhile, make gravy. Pour pan drippings into a fat separator and allow liquid to separate. Alternatively, strain the pan juices into a large pot and skim off the fat. Mix together separated pan juices, 2 cups chicken stock, and 3 cups water in a large sauce pot. Bring to a boil. In a large bowl, cream together butter and butter to form a paste. Slowly temper in hot liquid into paste. Whisk in 1/2 cup of hot liquid at a time until you have added 2 cups of liquid. Whisk until mixture is smooth. Pour mixture back into sauce pot. Continue to cook over medium heat, whisking constantly until gravy has thickened. Reduce heat to low and simmer for 6-8 minutes. Season to taste. Serve with turkey. This recipe is cooked breast side UP. This prevents lines from forming on the breast. However, if you will be carving the turkey ahead of time and serving it pre-sliced, I suggest cooking the turkey breast side DOWN. This will result is a juicer turkey breast.